Each week I log into my account and chose 3 meals out of the 5 they are offering. All the ingredients are surprisingly fresh as the name would lead you to believe. To be honest, the meals are not what I would normally pick if I was looking through a cookbook, but that’s half the fun. Did you know I like Tilapia? Me neither! It also guarantees that my family is eating 3 healthy meals a week – which as a family with working parents is a huge win. On Friday, when I chose my meals to be delivered, I come home to a well packed box with 3 bags. Each bag contains the measured ingredients for each meal and a recipe card with pictures and detailed instructions. When I am ready to make a meal, I just pull out the recipe and bag and get started! Each dish can be prepared in about 30 minutes and is more than enough for 2 people, and you can upgrade to 4 people if your family is bigger or you are having guests. Meat-free house? No biggie! They have veggie boxes too. The food is also kid friendly and Mikey is at the perfect age to instill a love of vegetables. Did I mention that each week is $69 and you are not locked in? Each week I am able to see what the menu is either opt in or opt out. I love not committing based on our tastes, schedule and budget. The only downside is you still actually have to make the meal. But if you HAVE to make dinner (and Child Protective Services likes to know kids are eating), HelloFresh is the easiest and healthiest option. 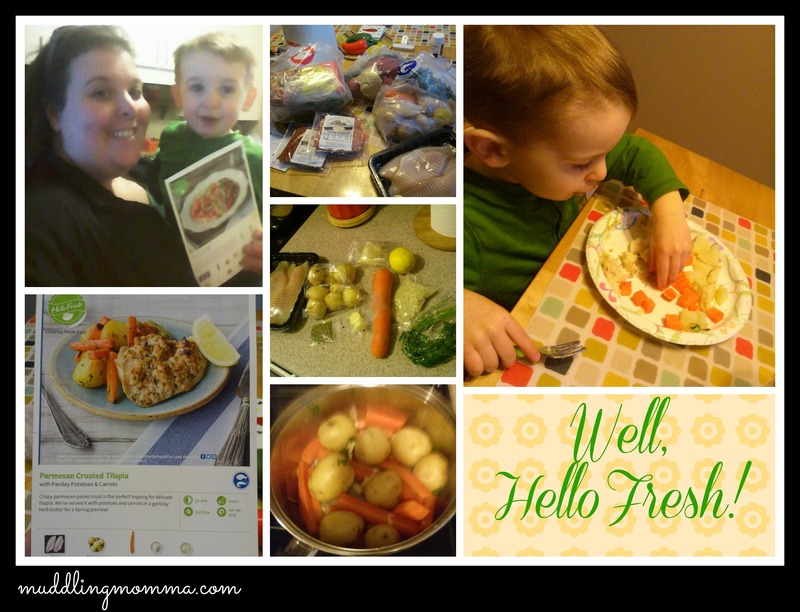 Want to try HelloFresh? Use this link to get $40 off your first box. I bet you couldn’t buy ingredients for 3 fresh, healthy meals for $29. I signed up and after my first week, I told HelloFresh I was going to do a review, so they gave me a free week to try. They can’t afford to pay me for a good review, so I gave them an honest one.